Who's gonna play the JP server? Poll: Are you playing Closers JP? (06-29-2015, 07:51 AM)Nova Wrote: I can't even bother myself to log in again even if it's to experience the area after G Tower, so I don't think I can even bother myself sign up for the JP version. Especially since it'll mean having to go through a bunch of hoops again just to secure an account. I'll be over there fosho~. The KR server is awesome but I kinda want to understand what I'm reading instead of relying on translations. .-. Also, no stamina bar bs. Hopefully. =l There wasn't a stamina bar in the CBT. If you require any sort of language assistance with Closers JP or any JP game, feel free to PM me. It's 2015 and SEGA doesn't know how to spell 'Congratulations'? When you juggle a bunch of other MMOs that encourage making a ton of alts and other games that have you checking in every few hours, you'd get burned out too. 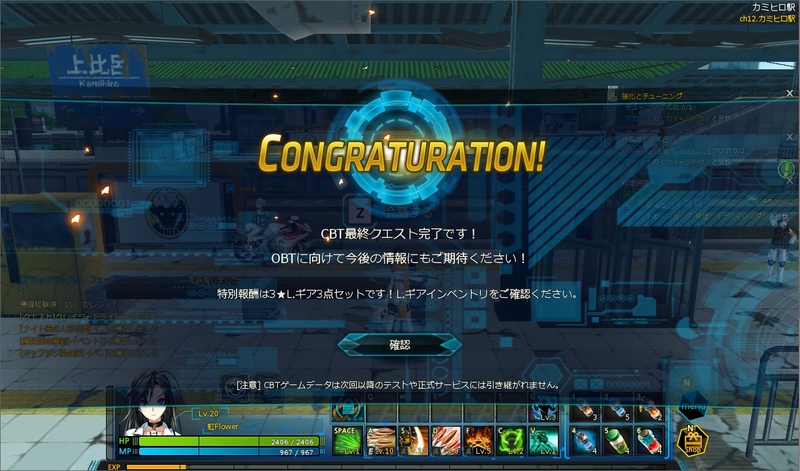 (07-30-2015, 11:22 PM)Nova Wrote: It's 2015 and SEGA doesn't know how to spell 'Congratulations'? TBH, I totally understand why they goofed. "R" and "L" differentiated in Japanese. They're basically the same sound.